On January 13, 1833, President Andrew Jackson wrote Vice President Martin Van Buren expressing his opposition to South Carolina's defiance of federal authority. He closed with the assertion, "nothing must be permitted to weaken our government at home or abroad." The Nullification Crisis of 1832-33 erupted the previous November when South Carolina nullified a federal tariff that favored Northern manufacturing over Southern agriculture. Complicating matters, Jackson's vice president at that time, South Carolina native John C. Calhoun, firmly believed states had the right to overrule federal laws. South Carolinians agreed and planned to use armed force to prevent duty collection in the state after February 1, 1833. Calhoun developed the idea of nullification—first put forth in the Virginia and Kentucky Resolutions of 1798—as a strategy for the South to preserve slavery in the face of a Northern majority in Congress. 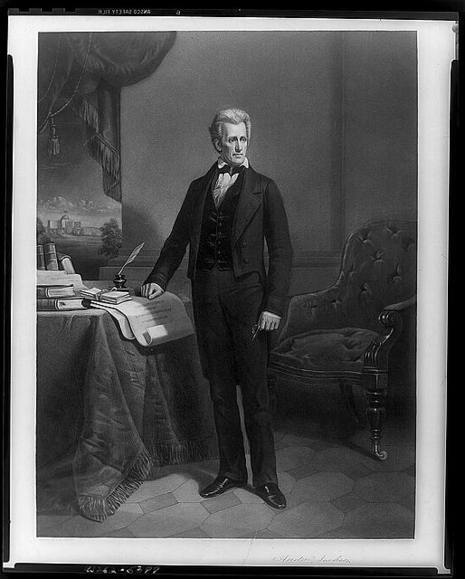 His support of the measure, disclosed midway through his term, was not shared by President Jackson who feared nullification's power to split the Union. This difference of opinion permanently distanced the president and vice president. The Nullification Crisis was a sectional crisis during the presidency of Andrew Jackson created by the Ordinance of Nullification, an attempt by the state of South Carolina to nullify a federal law passed by the United States Congress. The highly protective Tariff of 1828 (also called the "Tariff of Abominations") was enacted into law during the presidency of John Quincy Adams. Opposed in the South and parts of New England, the expectation of the tariff’s opponents was that with the election of Jackson the tariff would be significantly reduced. The nation had suffered an economic downturn throughout the 1820s, and South Carolina was particularly affected. Many South Carolina politicians blamed the change in fortunes on the national tariff policy that developed after the War of 1812 to promote American manufacturing over its British competition. By 1828 South Carolina state politics increasingly organized around the tariff issue. When the Jackson administration failed to take any actions to address their concerns, the most radical faction in the state began to advocate that the state itself declare the tariff null and void within South Carolina. In Washington, an open split on the issue occurred between Jackson and his vice-president John C. Calhoun, the most effective proponent of the constitutional theory of state nullification.